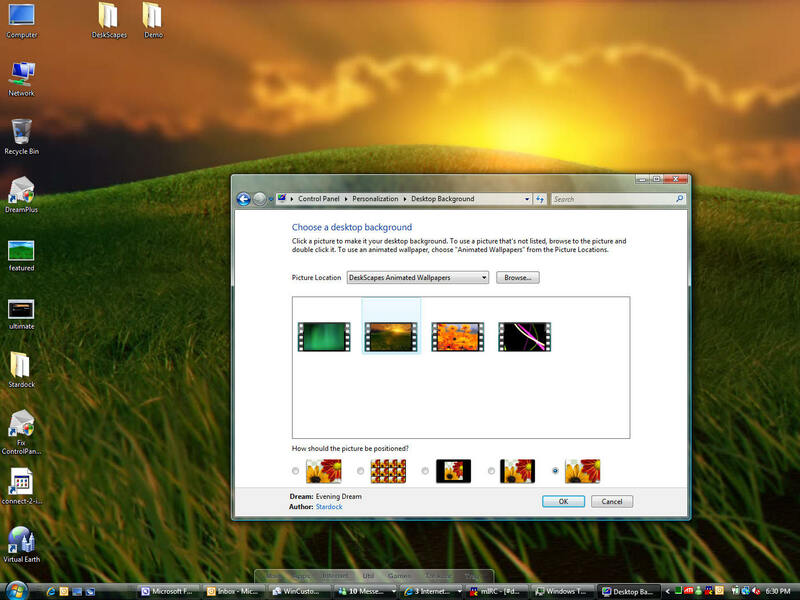 As Microsoft just announced, one of the first Ultimate Extras (extra features users of Windows Vista Ultimate can download) is a new animated wallpaper feature called "Windows DreamScene". So what exactly is Windows DreamScene? And what are the extensions and enhancements coming out for it? Windows DreamScene is an animated wallpaper technology developed by Microsoft that plays high-definition video content as your wallpaper. The key ability of it is that it can do so without using significant amounts of CPU (basically the decoding of the video is the only real CPU use involved). The animation itself is run through the hardware accelerated DWM. Software developer Stardock, makers of popular desktop enhancement utilities such as WindowBlinds, DesktopX, ObjectDock, etc. worked with Microsoft on the creation of content and has developed a number of tools to extend the feature set of Windows DreamScene. On the content side, Stardock Design created a number of 3D animated content for Microsoft including the default animated Aurora. Microsoft is holding back on releasing all the content they have until Spring 2007. 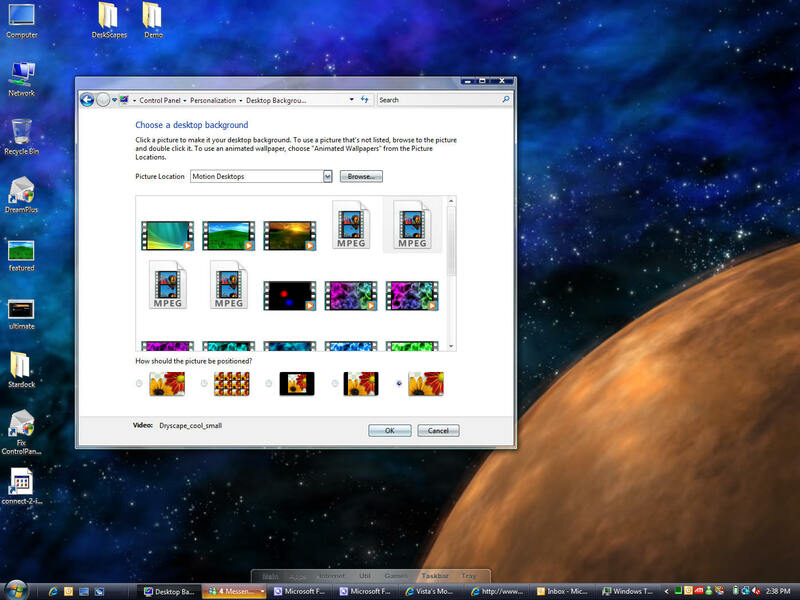 Stardock also added support for animated wallpapers on its popular WinCustomize.com community site at Dream.WinCustomize.com. With regards to the additonal tools and enhancements Stardock has released two of them. The first enhancement is a new program called DeskScapes. DeskScapes extends DreamScenes to support dynamic content (i.e. videos are pre-rendered). With dynamic content, you could have your wallpaper change based on weather, time of day, or news. Or you could just have some cool Direct3D "stuff" that runs (like one of those fish aquariums running as your wallpaper). The other key feature of DeskScapes is that it introduces the .DREAM format. This allows artists to protect their artwork. The .DREAM format supports triggers (changing what is playing based on specific triggers) and it allows creators to insert their author info and a link to their website which we think is crucial to encourage artists to spend the time to create good animated wallpapers. The other tool Stardock is working on is tentatively called Dream Maker. What it does is make it easy for authors to create .Dream files. Its goal will be to help make it as easy as possible to create your own animated wallpapers. To learn more about Windows Vista Ultimate, go to www.windowsultimate.com. 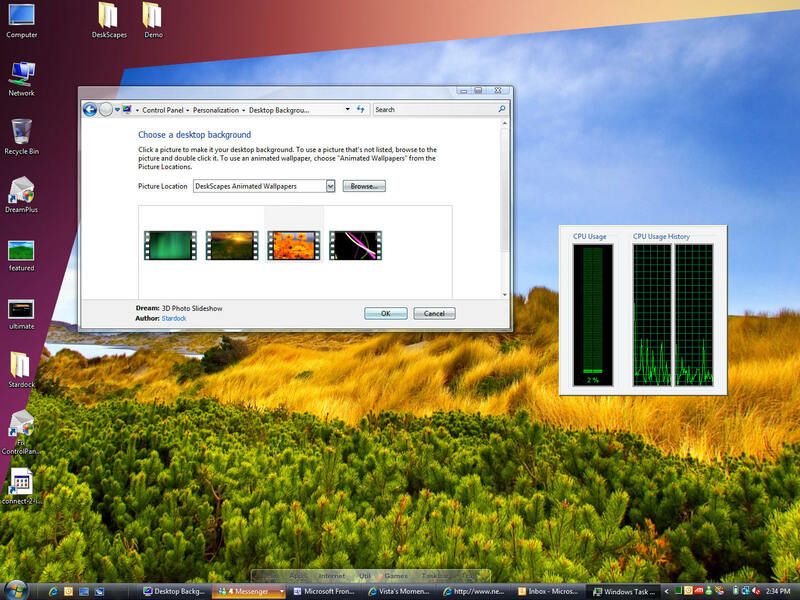 To download content to personalize your Windows Vista experience, visit www.wincustomize.com. (1) Dyanmic content uses virtually no CPU, it's all on the video card. (2) DreamScene in action. (3) .Dream Files support author info. Very Nice! One of teh more fun reasons to Upgrade to Vista Ultimate. I have a question... why are the taskbars (and inherently the window borders) different between screens 2 and 3? why are the taskbars (and inherently the window borders) different between screens 2 and 3? Looks like another good reason to plan on upgrading to Vista. I especially like the new Web site name, Dream.WinCustomize.com, sounds like a real feather in the WinCustomize cap. Whoa! Is there more special features? Due to DreamScene being a Windows Ultimate kind of thing, how do content authors preview this on other versions of Vista? We all know that they (MS) want these things to be available only to Ultimate users. But there are always aspiring artists and content creator from all versions of Windows. What keeps these things exclusive and how will authors preview their work on their machines? Unfortunately, they'll need Windows Ultimate presently. Incidentally, DeskScapes will be part of Object Desktop. I've been saying this should be in Windows for years! It's great that they've finally put it in. One question though: How does it handle resizing to different resolutions - is it smooth, or will things looked jagged and pixelly? I especially like the new Web site name, Dream.WinCustomize.com, sounds like a real feather in the WinCustomize cap. Availability? Does/Can it work with a DVD you might be playing in the player? Or your TV tuner? I'd love to watch movies this way while I work. This is just a commercialized version of the desktop video background seen in vlc and intervideo's dvd software, etc. The Milkdrop plug-in can do this with its visualizations in WinAmp and it's pretty friggin amazing to have all your transparent windowblinds and desktop x gadgets working over live animation - animating to the beat/tones of the music you are playing and listening to. Very cool. For video, having a TV show or movie playing in the background of a second monitor while you work is just one of the uses beyond the "moving wallpaper" aspect of this. The use of the native display code in Vista to make this low impact is what would be/is revolutionary. I look forward to seeing video of this in action, with windows drags and drops, etc. Three still screenshots are all but a waste of time/bandwidth given this feature, haha. While MS may want this as an Ultimate Extra, I see no reason this won't work on any Vista incarnation with the Aero interface enabled. I'm glad it appears to be part of Object Desktop as I intend to do a LOT with this feature in a number of ways. I've been working through the desktop background layering issues in XP for years now as an end-user. Thanks Stardock for commercializing this amazing feature so I can count on it in my day to day productivity/life. notes mpeg support, so DVD playback should work, even though it may or may not handle this directly. Brad? Do we have to transfer the DVD to the local hard drive or can anything played in Windows Media Player on Vista work "through" this? When will DeskScapes be available- I can't wait!!!!!!!! Looks like the current Ultimate Extras come out January 30, but maybe Object Desktop people will see it sooner than that for beta testing, yes/no? Can't help but notice that "Blissful" is shown in the third shot, but as a sunrise or sunset. Is that going to be one of the dynamic DeskScapes? Because that would be HOT. As I understand DeskScapes, basically all you're doing is using some sort of XML feed or service to determine when to swap out video. So if you do it based on time, perhaps you're reading the time in the system, but for the weather, maybe you're reading it from the weather gadget or something. That said, how does DeskScape handle the switch? Is there a noticeable "pop" as the new video loads? How do you handle transitions from one video to the next? God, I have so many questions! 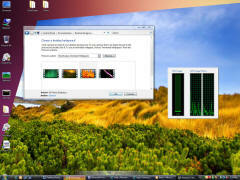 Excalpius: Deskscapes will require Windows Vista Ultimate. SuperRob: Deskscapes does not just do video or video with triggers. We can also render true live 3d content on the desktop. The first screenshot is an example of that. If for example you wanted a spinning teapot on your desktop, we can do that. We can even mix video & 3D content together. In terms of switching between videos, that does depend on how quickly the file can be accessed on the hard drive. Though we could cross fade videos in, or preload if it becomes a problem. You do not get a black flash or anything like that! This is my question. I love what dreamscene is going to be and I am by far a fan of stardock. But as of late WC has been slow. What will this new site do to the bandwidth? Will WC/Stardock be able to handle it? Also will dreamscene turn into desktopgadgets.com or is this something that will be promoted?